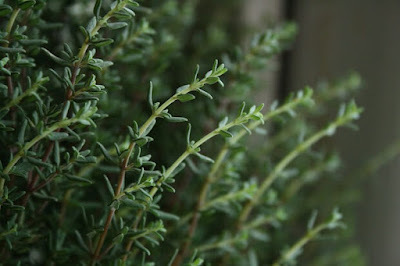 Thyme is native to the Mediterranean and was widely used by the ancient Greeks. Thyme is a very large part in Mediterranean cooking. This might be the reason why Greek women have less than half the incidence of breast cancer compared to American women). They reported in the journal Nutrition and Cancer that Wild Thyme induced cell death in the breast cancer cells. Thyme essential oil was found to kill 98% of human breast cancer cells (MCF-7) in vitro after 72 hours of treatment. This was at a concentration of just 0.05% (at 0.01%, thyme essential oil still killed >40% of the cells). Thyme essential oil was proven to be the most powerful at killing cancer cells. In other studies, thyme has also shown activity against oral and ovarian cancer. Thyme, or its essential oil, has also been used in Ayurvedic and traditional medicine owing to its strong antioxidant, anti-bacterial, and anti-fungal (potently killing yeast such as Candida) properties. It makes a great addition to a healthy diet focused on organic fruits, vegetables and whole foods and can be used as a flavorful herb in cooking or simply prepared as a tea. Thymus vulgaris. Parts used: leaves, flowing tops. Thyme has potent anti-microbial properties, attributed to the high content of essential oil found in the plant. Thyme also possesses a muscle-relaxant effect and an ability to thin mucus in the lungs, making it easier to expel. These combined effects make thyme a formidable remedy when it comes to treating respiratory conditions, such as colds and flus. Thyme can also be used as a gargle for sore throats and tonsillitis. In addition, thyme alleviates the symptoms of indigestion, such as gas, bloating and cramps, and its antimicrobial action can also be helpful in treating gastrointestinal infections.